Tesoro Viejo is located off Highway 41 at Town Center Blvd. When The McCaffrey Group and Lyles Diversiﬁed, the two local family-run companies with deep roots in the Central Valley, began planning Madera County’s newest master-planned community, Tesoro Viejo, they envisioned a richly rewarding place for future generations to call home. Unprecedented natural assets were in place, including panoramic scenic views of the Sierras and a topography of rolling hills and preserved open spaces. The challenge was to amplify those elements with a thoughtfully built environment. One that would itself inspire a strong sense of community. 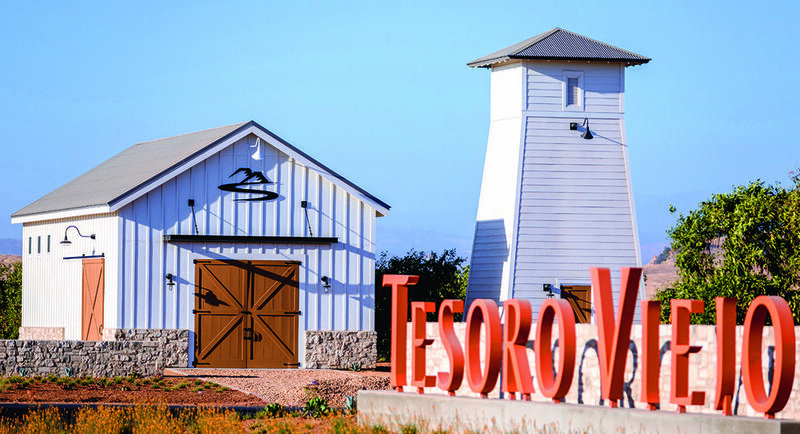 Town center small town U.S.A.
There’s a feeling you only get when you visit the Main Street of a small town, and Tesoro Viejo is building on that timeless appeal. Where everything you need and desire is in one place. ‘The Hub’ is now open with an innovative Welcome Center and AXIS, a neighborhood coffee bar and eatery, offering free-trade coffee and a seasonal menu. Across the way is the new Madera County Fire Station and Sheriff Substation. Breaking ground later this year will be a brewery and tap room. Town Center will also boast an Event Lawn for seasonal community events, like outdoor concerts and a tree-lighting ceremony during the holidays. Hillside Village, the ﬁ rst of nine villages at Tesoro Viejo, will offer diverse housing options to ﬁ t a wide range of lifestyles and needs, and will feature a resort-style clubhouse, an amphitheater, and neighborhood parks along with miles of scenic trails that border natural open spaces, making Hillside Village feel like a quaint neighborhood surrounded by nature, encouraging residents to live active, healthy lives. Opened this August for the 2018-19 school year is Chawanakee Uniﬁ ed School District’s Hillside School that serves transitional kindergarten through 8th grade. Featuring a science, technology, engineering and math (STEM) curriculum, as well as a college and career exploration program, the school provides students an opportunity to learn about careers in the medical ﬁ eld and biotechnologies. Designed as a true neighborhood school, it features state-of-the-art facilities, including a library/media center, music room, outdoor learning spaces, and athletic facilities with gymnasium. The 1,600 acre-site of rolling hills and vistas has been designed to capture the scenic surroundings and natural beauty of the land, maximizing opportunities for residents and visitors to interact with its unique topography. Nature trails, nearly 400 acres of permanently preserved open space, parks, and recreation areas, plus access to the San Joaquin River, help residents live the epic lifestyle of their dreams. In the words of Tesoro Viejo, its life, unprecedented.